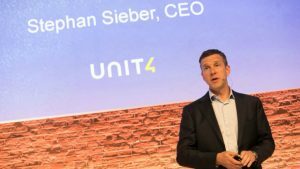 Stephen Sieber was appointed CEO of Unit4 in April 2016. Enterprise Times spoke to him at Unit4 Connect. The event provided an insight into the culture that Sieber has inherited. The company embraces its multiple cultures and includes a degree of humour that is above average for many corporate environments. Stephan Sieber: I’m less inspired by persons and more inspired by actions that people do and everybody who lives a passion. The passion that comes with strong values is something that is inspiring for me. I have many people that inspire me just because of what they do and how they do things in different parts of my life. It’s not only professional, it’s also personal, private and in my hobbies. I’m inspired by my wife. There is somebody who lives absolutely strong values and lives them herself every day and is a role model in this. That’s an inspiration for me. ET: What is your leadership style? Stephan Sieber: You’d probably have to ask people that work for me. I would say it is a direct, open, rather fast paced leadership style. I try to be very non-hierarchical in the sense that everybody can talk to everybody in the organisation. Elon makes a big fuss out of this. I think it’s the absolute normal thing. Anything that helps us with speed, priorities and focus. ET: What are your business challenges for the next 12 months? Stephan Sieber: I truly think that talent is the number one driver of our success and everything that comes with talent, talent acquisition, talent development, talent retention, strategic workforce planning. Understanding the profiles and the skill sets that you need, not only today, but also the ones you need in the future in order to remain successful. We are the most people-centric business of all businesses. We are pure IT. We are pure intellectual capacity and capability and that all comes with people. Stephan Sieber: Acquisition, retention and development. It’s a very competitive market we are in. For me, as somebody who works for large multinational firms, I clearly see a difference in our ability to attract talent. We’re really thinking hard about what is our value proposition to employees. Job interviews have changed. We’re not interviewing candidates anymore. We’re selling a vision. We’re selling a purpose. Of course, we’re also looking for the skills. There is a massive change going through the workforce. ET: What are your personal challenges? Stephan Sieber: Finding enough time to also do those things that are a priority for me outside my job. Spend time with my family. I’m a person who is very interested and curious. I’m naturally curious and I usually have a few hobbies that I follow very passionately and they require some time and attention. It doesn’t make it easy if you’re anyways travelling a lot. Stephan Sieber: We had a project with my previous employer that was very close to my heart. I could live on the job because it was a project that I had personal access to and was extremely passionate about. I came up with the idea. I was driving it and it didn’t work. The way we dealt with it was just brutally open, honest and straight up. It accepted the fact that there was a crisis. Accept the fact that something needs to be corrected and changed. Bring the right people onboard. Take yourself out. Take your emotions out and just look at the problem as it is and solve it. ET: What is your proudest moment? Stephan Sieber: Every customer that I know that is happy with what we do is a proud moment for me. I was recently at the steering committee meeting where a customer actually brought in end users and customers as part of the steering committee. Those people in the steering committee said how much they enjoy being part of this and how much they look forward to be working with the IT infrastructure and the application. That was a very proud moment for me because it showed me that we are really helping our clients to create value for their clients. It is the ultimate KPI for success in the share economy, the collaboration economy, the cloud economy, the everything as a service economy. I think customer success needs to be your success KPI. Stephan Sieber: We should enjoy and embrace – diversity and cultural differences. You should try your very best to create a culture where people perceive the cultural differences as something that is the new. You should be aware of the cultural differences, but you should not be afraid. You should embrace them and look at them as an opportunity. Then you can create pretty cool multinational teams that also benefit from each other because they learn to play, in some sense, with cultural differences. ET: Handling stuff with humour? Stephan Sieber: … and each other’s humour. Humour is probably the most important recruiting requirement. I had an assistant in my previous life. She was worked with me for seven years and she moved with me back to Switzerland, so we were really close. At some point in time I was doing something similar to this and it was about hiring. She said, “You only hire funny people.” It’s true. I really try to. There’s nothing worse than hiring boring people. ET: Venture capitalists invest for a set time, when that investment period comes to an end. What’s the impact on the CEO and how do they approach it? Stephan Sieber: It is no secret that private equity companies buy companies in order to sell them again. That’s what they do. At some point in time, Unit4 will have a new owner. My job is to make the company as successful as possible. If I do this, then this new owner will look at us and will buy us or will want to own us because of who we are and because of what we do and not because of what this organisation thinks it can make out of us. My job and my sole focus is on making our strategies stronger, making our strategy execution more successful. That goes in line with delivering superior service and products to customers, driving customer satisfaction. The moment you are not successful anymore, people feel that they can do better than you. Then they either try to merge you, they try to realise massive amounts of cost synergies, or they try to put you on some set type of management scenario. The only thing that really helps to keep a company successful long term is innovation and customer success. By doing this, I contribute directly to value for all the stakeholders involved including the shareholders. Hopefully I’m doing my job. ET: What was the last business book you read? Stephan Sieber: “From Good to Great (by Jim Collins), which I think is an excellent book. I read it recently, the second or probably the third time. I sometimes just read single chapters out of it because it is indeed a totally different challenge to take a good company and make it a great company than to run a startup. Stephan Sieber: I think the worst decision is if you listen too much to other people. As a CEO, I’ve realised I’ve never had a role where I have more people who felt that they should tell me how they felt that things should be done. While I do listen, and it’s absolutely important to listen, you should also make sure that you do not take yourself out of the decision. It needs to be ultimately your decision and, frankly, you also need to trust in yourself. You need to have the confidence that you’re taking the right decision even though probably other people tell you that you should do something else. The best situation for those situations where I listened, I gathered feedback, I critically asked myself and questioned myself, but ultimately I did what I felt was right and what I could stand behind wholeheartedly. The worst is exactly the opposite. ET: If we took out the what’s and the how and Simon Sinek talks about the why, what is your why? Stephan Sieber: Creating the conditions for people around me to be successful is one of our behaviours. It’s one of our company behaviours and it’s something that means a lot to me. It’s about realising potential. It’s about seizing opportunities. I am very bad in letting opportunities go. That sometimes makes it very hard for people to work with me. Seeing people around me living up to their full potential, developing and realising their own growth. There is also something in that everybody has their own definition of growth. That’s something that I need to learn and also accept people who have a different definition of growth than I have, but give them the opportunity to live up to their own potential. I would say that’s my personal why. What I mean by own growth, for me progressing in my job is important, not because I don’t care that much about hierarchies and titles and these types of things. I do appreciate I am in a position where I can have an impact and where I can see the consequences of my own actions, but getting along, getting ahead, getting progressive is incredibly important for me. Other people have other values and other objectives. They have a different definition of personal growth. That is something that I just needed to learn. A diverse team, a team with different roles, with different people, different ages, different social backgrounds, also has different growth objectives. Still you need to be able, I want to be able, to help the people around me to realise their own growth. ET: What’s your vision for Unit4 for the next three years? Stephan Sieber: I want us to be the category leader for business applications in the services industry. I want us to be the obvious choice for professional service organisations when it is about acquiring and delivering great products. The obvious choice for higher education organisations and institutes, when it is about driving students. The obvious choice for not for profit organisations to increase their social impact. The obvious choice for anybody who wants to benefit from that XaaS economy and who needs an application platform and technology partner to help to support this transformation in a flexible and modern way. ET: How do you prioritise your day? Stephan Sieber: Its changing, but I try to spend as much time as I can out in the field, which means with customers, with partners, but also with people, with our own people. I’d like to spend more time with the product organisation. I’d like to spend more time on innovation. That is probably something that I took as a personal objective for 2018. I want to be closer to product management, R&D, and engineering when it is about the next phase to make the next generations of our product. I do spend a fair amount on communication. We communicate in a very structured and a positive way. We spend a lot of time with leaders. Our strategic forum is the top 45 people of the group that we spend two days a quarter with physically, on site, working on specific topics. It needs to be well organised. It needs to be well managed. There needs to be preparation. There needs to be follow up. I’d say those are probably the three, four areas that I’m spending most time with. ET: What are the key business challenges currently faced by your industry? Stephan Sieber: Creating realistic expectations and delivering on them. Our industry has always lived on hypes. There is nothing bad about hypes because they get things going. They raise topics, they bring stuff to the surface. AI is a good example. We are also contributing and sometimes our industry is creating these hypes. I think it’s also our obligation to be realistic on the expectation we create, manage the expectation. ET: Which three technologies do you think will most influence your industry in 2018? Stephan Sieber: I would say artificial intelligence. It’s really narrow scenarios rather than large scale, general AI. It’s not yet there. I do believe that natural language is going to be taking off and picking up much faster. I still believe that the good old analytics, good old data management capabilities, in whatever form will have an impact. CPM is an excellent analytical application. You can think of simple, BI (Business Intelligence) scenarios. It’s something where overall I feel there is still a lot of improvement possible, giving the users, giving the consumers of a business process, some context sensitive embedded analytical support that they need to take better and faster decisions and then also deliver on them. Stephan Sieber: How do you bring your whole organisation to be in incubation? How do you make sure that your whole company is invested in constant innovation mode? ET: Can you answer that question yourself? Stephan Sieber: No, I’m getting closer. I think it’s around focus. I come back to the question starts with the why. Why am I here? Why do I exist? What contributes to my purpose? What strengthens my purpose and brutally selects everything out that does not contribute to that core purpose? The most difficult thing in focus is defocus. It’s more what not to do than what to do. You need to quickly understand these core values. Stephan Sieber: Very good. Thank you very much. It was a pleasure.